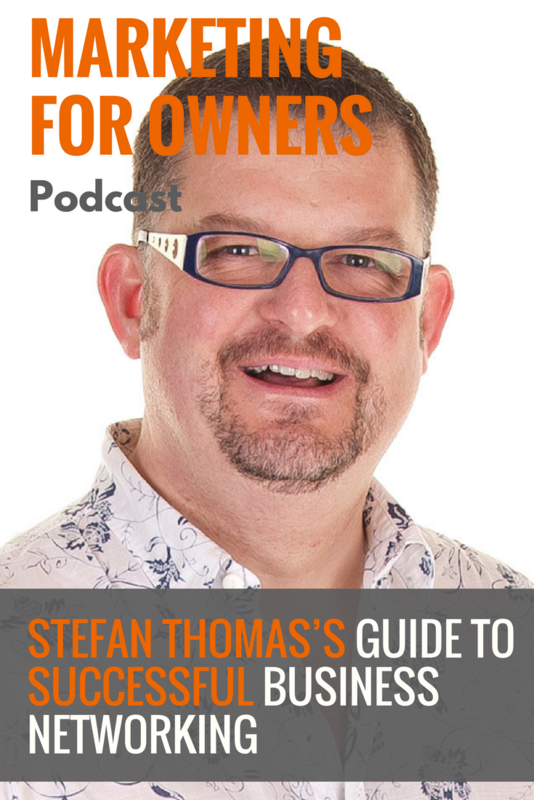 For well over 10 years, Stefan Thomas has been attending business events. When it came to attending his very first event, he was nervous and he completely hated it. However, he realised how useful it would be for him to keep going. He’s become quite a pro and is actually the author of the Business Networking For Dummies book. A lot of what he knows about networking came from working in a shoe shop as a teenager in 1983, and when he got his first full-time job as an estate agent in 1988. But after 19 years of doing that, he was forced to reinvent himself and bought a magazine publishing franchise in 2007. Three months later, he dropped it and began to write for other people. Through all of that, he carried on attending the networking events he’d started attending a few years previously, and he was increasingly picking up new business from it. Soon, he was being asked to tell people how he was managing it, and by 2013 had the opportunity to write the guide. From Stefan, you’ll learn how you can make a success of your networking events, by approaching them differently. And why you should keep going, because one day, you may end up in the right place at the right time like he did. The skills which Stefan uses are many of the ones he learned working in retail as a teenager, and then as an estate agent. But like other people who have had a career change forced upon them, he lost his confidence in his abilities. And it took him a while to realise that many of those skills he had were transferable. His first networking event was in 2005 when he attended a Witney Big Breakfast. He went as an estate agent, and he hated it. He was nervous and he admits that his first event was a disaster. However, he somehow overcame it knowing that it meant he could connect with lots of local people who could be potential customers, or at least recommend him to people they knew. He joined the BNI and then 4Networking in 2007. The first thing you have to do when attending a networking event is to remove the pressure of making it a success. People often go with a return in investment decided which is far too high. Particularly your first event, the only purpose is to meet people and just start a conversation, and don’t treat it like it is the entire conversation. So set the bar low in actually making business deals straight away. If you’re going to be required to give a 40 or 60-second introduction about yourself to everyone, prepare it before you go. And you can use social media to connect with people going beforehand. When you know people going, you’ll feel a lot less nervous. The chances are when you go as a newbie, the more experienced people attending will recognise that and will come over to listen to you. And when you start a conversation, don’t get wrapped up in wanting to say something clever, or giving them your elevator pitch. It is just like any other social situation, but with a different name. So start a conversation in the natural way you would normally as the same rules apply. One of the key skills you need for networking, and generally in life, is to actually listen to people. It isn’t just about waiting for your turn to talk. Some people just want to talk to you so they can quickly identify whether or not they can do business with you, and just listen as a courtesy. But the most successful networkers are the ones who actually listen to what is being said to them. And, believe it or not, it is actually interesting to find out about other people. Stefan doesn’t like elevator pitches, and that’s not just because we call elevators ‘lifts’ in the UK. It’s actually because of how effective they are. He is either going to get his chequebook out right away, or he is going to buzz security. And which one do you think is most likely? Elevator pitches presume that everyone is interested in you. But ultimately, everyone else is at these events to make sales and promote their own businesses. And this is where listening is useful. Instead of quick pitches, work out what you do that will actually interest people and make them want to speak to you. Tease them with the information you give out. That is the actual point of those 40 to 60-second introductions. And don’t simply fill it by listing all of your features, because then they’ll think they know everything about you already. When thinking about what to say, first think ‘so what?’ Think about how what you’re saying is actually going to mean to the other person. Features of your business are facts. Benefits are the outcome for the people who buy your products and/or services. By simply saying that you’ve been established for 17 years, you’re just telling them how old you are. But if you say that you’ve been around so long, that you’ve seen, and solved, every possible problem, you’re making it easier to see how you can help them, and therefore making you a more appealing person to connect with. When you go to events seeing the same people exhibiting again, and are amongst the same group of people wandering around, it can sometimes leave you wondering why you bother turning up. But it is still useful. Just like seeing the same TV advert, you may not need them now, but they want to be there for when you do want them. If people keep seeing you, they’ll remember who you are and what you do. When you see the same TV advert, you’ll remember them when you ready to buy. And you do exactly the same thing with your social media. As of 2017, Stefan has attended over 1,000 networking events over the past 10 years, including The Business Show in East London. It was at the social event which is part of it where he found himself sat next to a lady named Sarah. She was the Commissioning Editor at Wiley publishers. When he asked her whether they’d ever done a Business Networking for Dummies book, she said they were actually looking for someone to write such a book. Three weeks later he was attending a meeting, and another 6 weeks later had signed a contract to write the book. And then he went on to write another book for the publisher as well. Yes, he was in the right place at the right time. But that situation occurred because he kept turning up to events. The ROI for him had simply been making connections. In the past, he’d spoken to audiences of 3 people, and even no people. And he’d woken up at 4 am in order to get to events. But each one led to him becoming a success, as they all led to him sitting next to Sarah. Writing a book wasn’t something he’d set out to achieve, but it became his business card and now gets booked to speak at events on the strength of his book. Sometimes saying all the right things just isn’t enough, and you have to actually look like the person you’re telling people you are. People will judge you on the way you look and present yourself. If a disorganised person who always turned up late were to stand up and say they’ll help organise your business, then they are not going to be believed or trusted. You need to be a product of the product. People are at networking events to build up trust, and little subtleties will affect the way you’re perceived. Stefan found out that when people recommended his services to others, they would look him up online and do their research before making contact with him. So he decided that he needed to ensure that when people were checking him out, without him knowing, that he was giving them sufficient content to prove his worth. Business networking, social media, and content marketing all need to join up with an invisible thread to work together. You need to look at what you’re doing outside of networking events, to support what you’re doing at networking events and elsewhere. And that is why Stefan is now producing more online content. Should you want to make sure Stefan is keeping up to his promise of producing more content, and to learn for his useful insights, check out his website where you can read his blog posts. Also stay up to date with what he has to say on his Facebook page. For more information about his events and to join The Networking Retreat community, you can visit the website and join the dedicated Facebook group. And whether you’re starting out at networking or consider yourself a seasoned pro, Business Networking for Dummies is worth a read and you’ll learn some great tips which will help you become even more successful at it.